If you’ve read my review of the Nexus 7, you’ll know I surely love it and think it likely the best Android tablet on the market. It’s been a very good seller for Asus (the maker) and Google as well…and it looks like its about to get a refresh. The latest rumor from DigiTimes is that Asus is partnering with Google again to give us an updated Nexus 7, with perhaps an HD panel display, smaller side bezels, and an “upgraded version of Google’s Jelly Bean operating system” – whatever that means. Plunkett called this in one of his Fearless Predictions…it will be interesting to see if it comes true. I’m sure we will know by May, in time for Google’s I/O event. Carry on Google and Asus! What’s HTC got up their sleeve? We’re not sure…but as noted here, we think it might be a new superphone they want to announce to the world. That’s just a guess, but it looks like HTC is going to host an event on 02/19/2013 to announce something, and the M7 (or whatever its final real name is to be) is probably going to make its debut then. We’ve seen all kinds of rumors on this thing (see this and this to get caught up) and I for one am a little excited to see the “next gen” crop of phones that will likely start with the unveiling of this device. In what has been a reversal of fortune for one of the largest tech companies, Apple has lost the title of “World’s Most Valuable Company” after falling stock prices reduced its market cap to below $414 billion – slightly under Exxon’s market cap of approximately $417 billion. Shares of Apple were trading under $450/share at the time of this writing, a huge tumble from the over $700/share price it saw around the time of the launch of the iPhone 5 last year. This represents a drop of about 36%, just since September. The stock plummet comes as market researchers and analysts are wondering where Apple goes from here in terms of product innovation. So much of Apple’s edge has been built on staying ahead of their competition…but now that Android handsets and tablets are seen as viable (and in some instances more cost effective) alternatives to iPhones and iPads, the profit margins for the Cupertino tech giant are not what they once were, even a few short years ago. With new device launches possibly coming as early as March, it remains to be seen if Apple can return to its status as “top dog” anytime soon. Looks like Apple isn’t the only one making it rain stacks of cash. A day after Apple announced giant profits and revenues, Samsung is doing the same – showing a gigantic $8 billion profit in the 4th quarter of 2012. The reason: the incredible sales of the Galaxy S3 smartphone and the Galaxy Note 2 smartphablet. 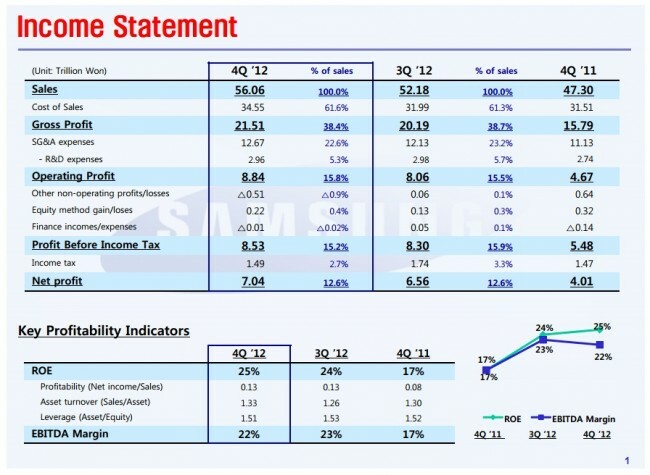 The profit alone represents a 10% quarter over quarter growth for Samsung’s mobile products division. Include the fact that Sammy is now shipping more smartphones than Apple and Nokia combined, its no wonder the company is enjoying record success. Samsung’s profits are pre-tax profits, but the post tax profit of over $7 billion is still large numbers. See the chart below for the full income statement…pretty impressive any way you slice it. As we move forward into this new year, we are likely to see a slew (maybe even 2 slews) of “mega” smartphones unveiled – the first to come could very well be Samsung’s Galaxy S4. The latest rumor is that a big reveal might be coming in March, with the go-live sale date coming shortly thereafter in April. This would be a fast launch by Samsung’s standards, and would be great news in light of a somewhat disappointing CES earlier this year. As noted in this article, this GS4 is likely to to feature the newest 8 core processor, as well as possibly 2GB of RAM, a 13MP rear camera, 2600mAh battery, a 4.99 inch FHD Super AMOLED display, and Android’s newest operating system (probably 4.2 or 4.2.1). I’m sure more leaks will be forthcoming as we get closer and closer to March. As the GS3 was (and is) a huge hit for Samsung, its likely that this new GS4 will be as well…provided that there are still a few people left who didn’t buy the GS3. More rumors as they hit the web! 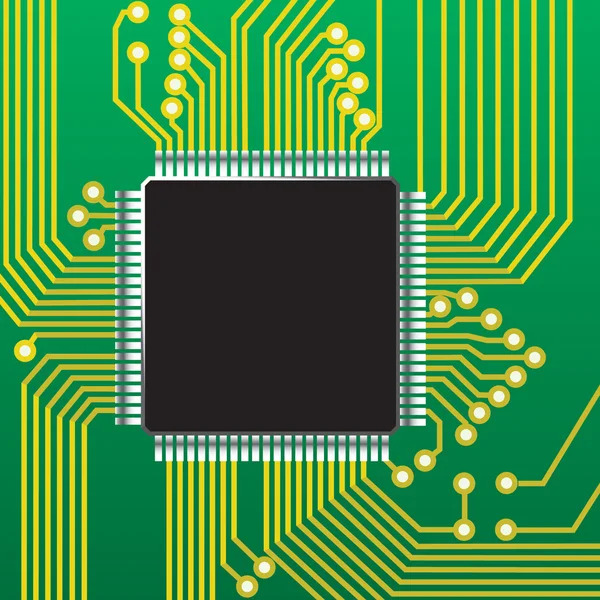 Recently, an AnTuTu benchmark showed up on the web for the Samsung Galaxy S4, and the microprocessor driving the whole show is the fabled “Octa-core” Exynos 5 (which features 4 high powered cores, and 4 lower powered cores, making 8 or octuple cores total). As this processor was only previously reported to be in the Galaxy Note 3, this is excellent news for those looking into purchasing the next version of Samsung’s already wildly popular Galaxy S series. The full bench mark indicates the processor is clocked at 1.8Ghz along with the 8 cores (with only 4 being in operation at any one time). This is some serious power folks. In more Blackberry 10 related news, slides of the training manual for the Z10 have presented more details of the specs of the device, including a 4.2 inch HD display (1280×768), Snapdragon processor, LTE & NFC, as well as 16GB of internal storage. Other goodies include 2MB of RAM, a 2MP front facing camera, and 8MP rear camera with a whopping 5x optical zoom. A reported 1800mAh battery powers it all, and (as any who used the old school Blackberry knows) it should easily get the average power user through a couple days of usage. The official RIM press conference is still scheduled for 01/30/2013. A non-official photo of the all touch screen device is below. Enjoy! [Rumor] Could this be the HTC M7? Its early in 2013, and the rumors are now starting to flow like wine at a Bacchan revel – the latest is a supposed photo of HTC’s new flagship smartphone, the M7. Sporting a look that could mildly remind one of the earlier iPhone iterations, the latest pic from @evleaks shows some very interesting things about the new device. The below pic shows an interest placement of speakers (both at the top and bottom) and no physical buttons anywhere seen. The edge to edge display has promise, and its rumored 4.7″ size should make a great viewing experience. There’s the sensors on the left and the front facing camera on the ride side, and not much more. Who knows if this will end up being the final version of the actual device, but the real meat of the rumor is that the device is close enough to release that it will be announced at the Mobile World Congress event taking place next month. One can only assume that more “sneak peaks” will be coming in the very near future as we get closer to a potential launch date. Enjoy! [Rumor]Nexus 5 smartphone and Nexus 7.7 tablet to be announced at Google I/O? Leaks this morning indicate LG and Google will announce a Nexus 5 smartphone and an upgraded Nexus 7.7 tablet at Google I/O in May. The Nexus 5 is pegged to have a 5″ 1080p screen, a Tegra 4 processor, 2GB of RAM, a 3MP front and 13MP rear camera, and 8GB or 16GB of memory. How much will this set you back you might ask? The leak indicates the price will continue to start at a mere $299 just like the Nexus 4. The Nexus 7.7 is said to have a 1920 x 1200 HD screen (294ppi), a Tegra 4 processor, 2GB of RAM, and at least 8GB of memory. Again, price is rumored to start at the same $199 price point as the current Nexus 7. The leaks sound plausible and may help explain some of the comments made by LG Senior Vice President James Fisher last week. If you recall, Fisher said “Through our collaboration with Google, we launched the LG Nexus 4 smartphone. This is the first of many devices to come from our growing partnership with this very selective company.” Considering LG can’t even keep the Nexus 4 in stock, it seemed odd to already be talking about future products, but hopefully Fisher was referring to the Nexus 5 and 7.7. 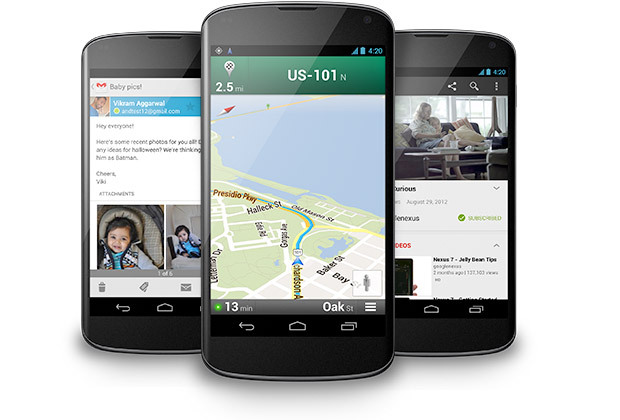 Google is also rumored to announce Android 5.0 (Key Lime Pie) at Google I/O. Who knows, maybe we’ll get an upgraded Nexus 10 with the Exynos 5 octa-core inside too? All I know for sure is May suddenly can’t get here fast enough!